Many companies have been creating “green” products that come from recycled water bottles or other materials. Major home cleaning brand, Windex, has just joined the mix in creating green products that save our planet! Their new product featured is the 100% Ocean Plastic Windex Vinegar Bottle which is part of the Windex Help Seas Sparkle campaign. 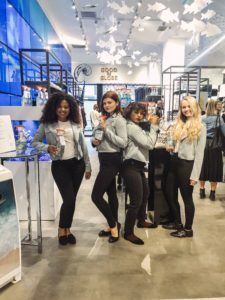 Windex joined forces with Bloomingdales Good for the Globe initiative which focuses on earth-friendly brands and products. 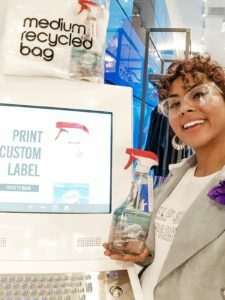 As part of this event, consumers who purchase the 100% Ocean Plastic Windex Vinegar bottle can select a beach to honor and place on their bottle using the kiosks available at select Bloomingdales stores. Windex also created a spin-off of the iconic “little/medium/large brown bag” at Bloomingdales. Their version is renamed the “medium recycled bag” and is available for purchase at the event. 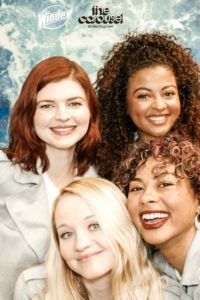 CEA Staffing has the incredible opportunity of working with Windex to raise awareness about ocean pollution and promote their new house hold cleaning product! Now, let’s get into some facts about our beautiful oceans shall we?! Did you know that 70% of our Earth’s surface is ocean? 97% of our water can be found in our oceans. By 2050, there will be more plastic in the ocean than fish! There are plastics called “micro plastics” which can be ingested by fish and other sea creatures. The plastic found floating on the waters surface is not the only debris. Actually, there is more plastic at that bottom of the ocean and floating around that we cannot see. Most of the plastic found in the ocean is land based. It originates from the coast including far inland. Debris can be carried by storm drains and sewers and end up in our oceans. Some plastic pollution comes from ships. Netting and other materials found on cargo ships and fishing boats can end up in the water and harm marine life. Sea creatures may get tangled or trapped in some plastic materials which ends up killing them. Not to mention, micro plastics and even larger plastic materials can be swallowed by marine life and can be fatal. Micro plastics that are ingested by sea creatures can be absorbed into their bodies. Not only does plastic pollution effect our oceans but there are also other kinds of pollutants that you would never think of! Burning of fossil fuels impacts our oceans as well. The carbon changes the pH levels of the water which leads to acidification. By the end of the century, our oceans could be 150% more acidic than right now. Shellfish require calcium carbonate to build their shells and if the carbonate levels decrease those fish will be unable to create their shell and that impacts their survival. Marine life that relies on shellfish for their food will then also be effected. The acidic water can bleach our vibrant coral reefs which makes it harder for some fish to sense predators or find prey. Did you know there is such thing as ocean noise pollution? Sea creatures such as whales and dolphins rely on sound waves to communicate. This is how they find food, mate, and navigate. Cargo ships that travel through our oceans are greatly effecting these mammals communication by limiting their sensory range. Ships with high powered air guns send loud blasts every 10-12 seconds for weeks to months and travel up to 2,500 miles. These ocean noises disrupt the normal behaviors of the marine life and can be fatal. Not only is all of the pollution impacting our marine life and ocean water but it effects us too. Some coastal communities rely on the shellfish industry for their economy and the lack of shellfish has cost those communities money and jobs. Fish, marine mammals, seabirds and our ocean water are all greatly impacted by the rising ocean pollution. Thanks to Windex we are one step closer to a cleaner ocean and cleaner planet. Also, use the hashtag #HelpSeasSparkle to spread the word! Meet Michigan Based Brand Ambassador Jessica! No Replies on CEA Staff’s Ocean Pollution Warriors! Commenting is Disabled on CEA Staff’s Ocean Pollution Warriors!